Of all the ancient places in Java I'd visited in recent years, one of the most impressing was Trowulan, a small town in Mojokerto, East Java, believed to be the former capital of the great empire of Majapahit. In the history, the empire was said to have expanded its power and influence throughout South East Asia in the 13th century. Today, the empire, together with its monuments has for so long crumbled, left behind the story of its glory. Thanks to Arief, a colleague of mine, for initiating the three-day-trip to trace the remains of the empire in Trowulan and Gunung Penanggungan, and Denok, a Surabaya native, for joining us in the trip, and also Arief Budi for the valuable information on Trowulan and becoming our tour guide. Despite the fact that we missed some significant places due to some technical matters, I was glad to have the opportunity to sense what the life in the capital was like in its heyday. What follows is a short journal of the first day of the trip. Thank you for coming. Our first stop in Trowulan was the museum that housed many artifacts of Majapahit. What first caught my eye were the green fruits shaped like a bowling ball which were grown all over the front yard. It was funny for me however that such a great empire like Majapahit was named after this fruit: Maja (Crescentea Crujete) which tasted bitter (Indonesian = pahit). That day, I saw a young boy tried to reach the fruit that grown just about a meter above the ground. Many stories of the past could be revealed from artifacts. 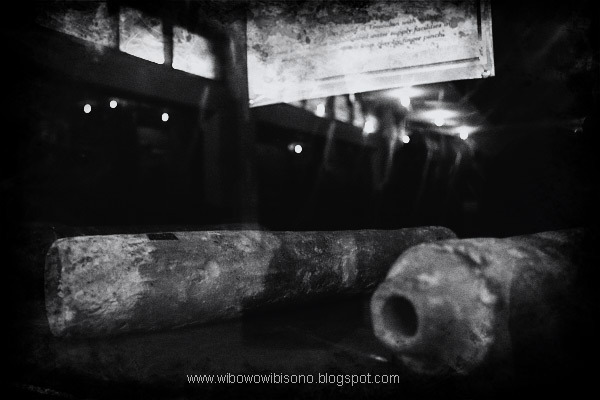 The artifacts displayed in the hall at the backyard of the museum became vivid clues to the everyday life in Majapahit. Some artifacts depicted how the men, women, and children dressed up centuries ago. I also noticed that the people at that time settled in clusters of houses. Each cluster, known as “pekuwuan,” consisted of four to six houses. I was amazed by the fact that they had recognized a housing system that seemed to be more sophisticated than the one we have today in common. There was a big flatted stone written with some traditional letters (I was not sure whether it was Sanskrit or Javanese). Unfortunately, it was broken apart, so it was more like a puzzle that required an extra care to put those pieces all together. What I found inside the museum astonished me more. Never before did I realize that Majapahit was actually way more civilized than I had ever thought. This terracotta statue, for instance, depicted clearly how a woman dressed up in the past, and what accessories adorned her body. According to the information on the wall, the statue was some sort of toy or doll for girls and could also be a statue of a woman. I was definitely sure that the people of Majapahit had recognized the profession of architects. I learnt that before they built a temple, house, or any other buildings, they made a scaled model to study the proportion. 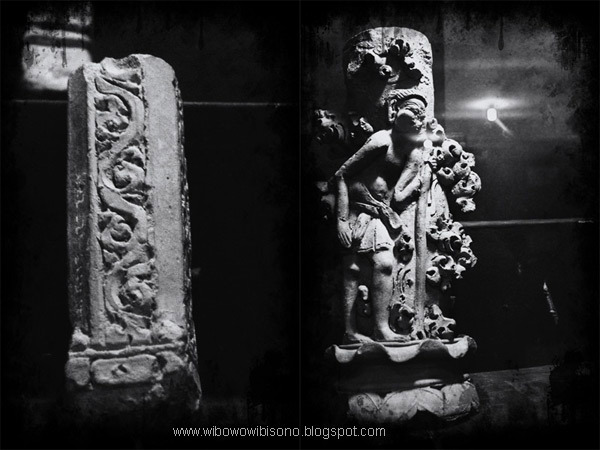 To adorn columns, the people of Majapahit use these ornaments which came in several motives like floral, humans, etc. Not only did they have architects to found the civilization, but also civil engineers. Water system was crucial since they had built pools, canals and public bath which required a complicated piping system. The pipes displayed in the museum were all made from clay. All these years, I had always thought that piggybank was firstly brought and introduced to the people of Indonesia by the Dutch colonialists. Well, I was wrong. Long before the Dutch came, the people of Majapahit already had their own piggybank. No wonder, Indonesians even today called that thing “celengan,” referring to “celeng” (Javanese for boar or pig). The bank also came in other shapes like elephant and human head. So these were what the archeologists had found in the kitchen of every Majapahit’s household: a stove to cook and a tray that reminded me so much of my mom’s Pyrex. All these kitchen apparatus were made from clay. I learnt about the coming of Islam to Java for the first time at middle school. 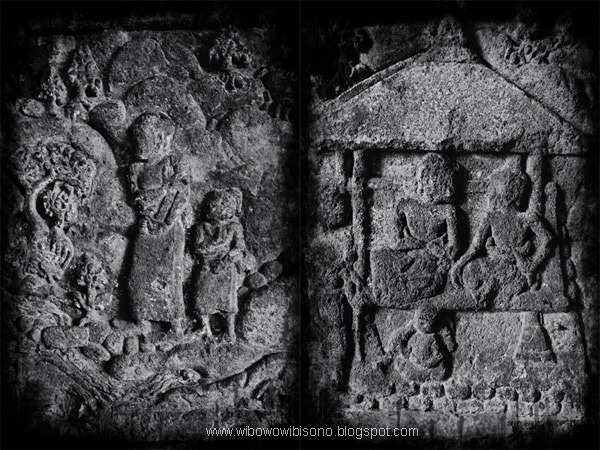 It was a gravestone of a woman, found in Gresik that had become the clue of what year the teaching of Islam came to Java. I’d always wondered what the tomb looked like. One room in the museum specially set to store artifacts from the early years of Islam in Java, finally put an end to my long wonderment. There, behind the glass, I stared at the gravestone of Fatimah Binti Maimun, a merchant woman who passed away on Friday night, the seventh day of Rajab (the seventh month in Islamic calendar), in the year of ca. 1054. So, evidently, Islam had come to Java long before the empire collapsed. The other artifacts I found in that room were brought from some old Muslim cemeteries in Java. One wooden inscription, carved with Arabic letters, was found at Pusponegoro tomb. It belonged to Kanjeng Kyiai Adipati Brojonegoro Adipati Sepuh. I had no idea who he was. Three gravestones were brought from Troloyo cemetery. It was an old cemetery for Muslim during the early days of Islam in Majapahit. All the stones were carved with Arabic and Javanese letters, indicating the name of the dead and also the years they passed away. The empire’s power and influence had lured many countries to send their delegations to Trowulan. Each coming of a delegation was marked with a small statue that depicted the guest. Maybe it was some sort of souvenir. I wasn’t surprised to see a statue of a Chinese guest wearing traditional hat, because the Chinese had for so long established a relationship with Javanese kingdoms. But I was surprised with the presence of a small statue, put at the front right, that to me, appeared to depict a European guy wearing a round hat and a curly collar on his shirt, and he was bearded. Was it possible that some European guy long before the first Portuguese explorer landed in Java, came to Majapahit? Well, I didn’t know for sure, but this was something new for me. The other statue depicted a man with a Turban. Maybe he was an Indian Sikh, or Arabic, or someone sailing from Central Asia. With the coming of people from many countries, I imagined Trowulan as a cosmopolitan city. At these days, most of us only recognize square shaped brick that is commonly used to build a wall. Centuries ago, the people of Majapahit dug a well and covered its wall with curve shaped bricks to create a circle well. This kind of well was found in many ancient settlements of Majapahit. Beside the circle one, they also built a square well which was built at many of their sacred places. As an empire who took control of the trades, Majapahit had its own monetary unit. I didn’t know the name of the currency, but I was told that they imported the coins from China. That was why there was a Chinese letters on each coin. Getting out of the museum, we walked a few meters away to an excavation site. This site, roofed with asbestos, used to be a settlement. Arief Budi told me that it had been a formal procedure of archeological excavation to dig the ground in several squares. Looking closer at the layers of the peeled ground, I could see pieces of broken porcelains and potteries. This was pretty much what a settlement looked like in that age. According to the relief I had seen earlier in the museum hall, a settlement back then was a group of four to six houses (a cluster) which was known as Pekuwuan. The gravels on the ground were probably the pavement for pedestrians, or maybe those were the floor of the house. Next, we moved to other excavation site which was also of an ancient settlement. I didn’t see any gravel pavement there, just something made of bricks that looked like a long corridor. To impress foreign delegations coming to the capital, Majapahit built a giant pool, named Segara. 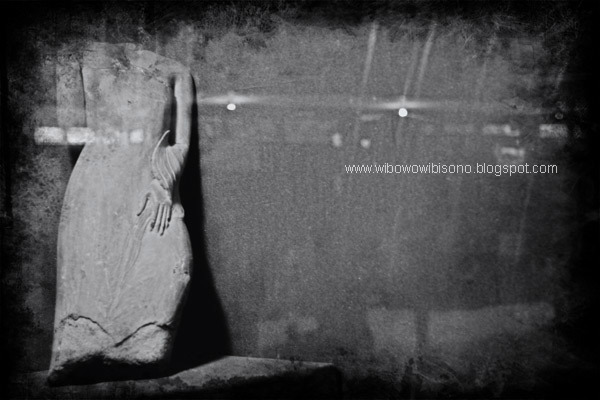 It was located across the Museum Trowulan. There, on the pool side, centuries ago, they entertained the guests with a lavish banquet. I guessed it was more like a garden formal seated party. They pulled out their best chinaware and silverware for the dining. What Arief Budi told us while we were walking around the pool side simply surprised me. He said that after the dining was over, they threw all the chinaware and silverware to the pool, giving an impression to the guests that Majapahit was a very wealthy empire. The guests had no idea that there was a net placed below the water to catch all the thrown wares. Since Henri Maclaine Pont - a Dutch architect who was also an archeologist dedicating few years of his life researching the trace of Majapahit in Trowulan - found this pool which had been buried for centuries, this place had been restored and then became a favorite spot for the locals to fish. The practice of syncretism was likely preserved in Trowulan. 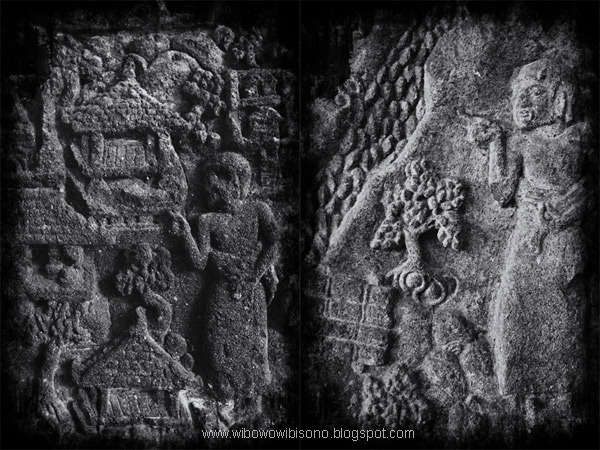 Many ancient places became sacred not only for Javanese but also for many people outside Java. On that day, a man came to an old Muslim tomb, believed to belong to Putri Champa, a princess coming from what today is Vietnam and marrying Brawijaya V (a king of Majapahit who was also known as Kertabhumi). The tomb could be reached by foot from the pool. Despite the noisy click sounds coming from my camera, this man remained undistracted. He was deeply immersed in his prayer. On the way back to the museum, while walking on the other side of Segara, we found terraces that led to the bottom of the pool. By stepping down these terraces, centuries ago, the royal servants picked up all the chinaware and silverware that had been thrown by their masters. I asked Denok to stand on the terrace so as to scale this picture. Ojek (motorcycle taxi) was the most effective public transportation to go around Trowulan. The drivers, which were all Trowulan natives, knew exactly where to go when it came about visiting the relics of Majapahit. That afternoon, with ojek of course, we headed to Desa Temon, where an ancient gate stood magnificently. I hadn’t read the history or anything about the gate, so I just nod along when Arief Budi explained me the story behind the gate which was named Bajang Ratu. Arief budi told me that this gate was some kind of back door of the royal palace. 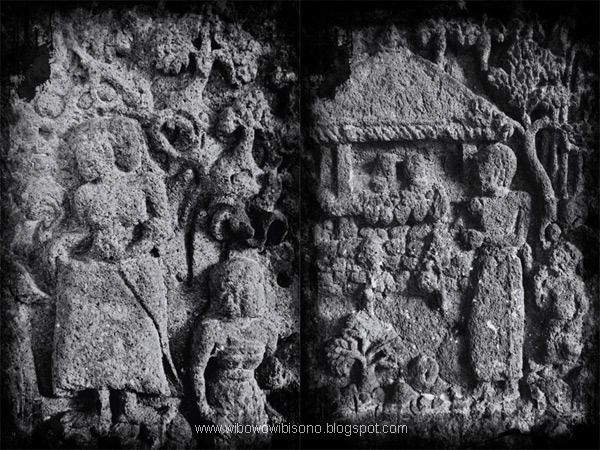 It was simply shown by the relief of Sri Tanjung, carved on the wall of the gate. I had no idea who Sri Tanjung was and why that relief was associated with back door and death. Yes, when the people of Majapahit mourned someone’s death, they usually came through the back door of the house. It’s a tradition that still prevails until today in Trowulan. 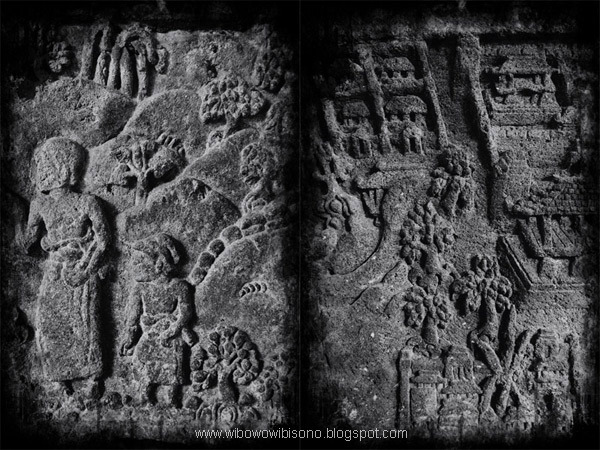 Beside Sri Tanjung, there was also a relief of scorpion. I didn’t know the meaning behind the symbol. I just admired how the sculptor carved the brick without breaking it. The absence of sunshine in that afternoon meant no shadows and shades on the temple. The geometrical pattern would surely look more dramatic with that natural light. Perhaps I should come back one day. If it was Denok I asked to scale the pool of Segara, for this temple, I asked Arief to stand and point his fingers to the temple so as to picture how grand the temple was. Many times, the naming of a historical site was not relevant with the real history behind it. Like those temples I had seen few months earlier in Dieng. They were named after some characters from the epic of Mahabharata. The archeologists seemed to have no clue and had to go along with the locals in naming the temples. Leaving the Bajang Ratu, Syaiful, the ojek driver, told me that our next destination was Candi Tikus (roughly translated as The Rat Temple). I thought the temple was shaped like a rat or it was a temple dedicated for the rats. Well, neither of the thought was right. Syaiful later told me that in the early of the twentieth century, there was an outbreak of rats in Desa Temon. The farmers strove to eradicate the rats by chasing them to their nest, hidden below a knoll, in the middle of a rice field. They dug the knoll, and bang! They found a temple which had been buried for centuries. Perhaps, to show their ‘gratitude’ to the animal, they named the temple after the rats. I guessed it was obvious from the way it looked that this used to be an open bath, either for public or for noble persons. There were two cubicles on each side of the temple. I assumed one for men, and one for women. The water must have been very well circulated back then as we found some nozzles on the temple’s wall, designed in the shape of some figure we didn’t recognize. Standing right in the centre of the terraces, I noticed that the temple was not symmetric. It was slightly more to the left. Arief Budi told me that the unsymmetrical was a character of temples built in East Java. Our journey that day was perfectly closed with a ballet performance of “Suryaning Majapahit” or The Glory of Majapahit, held at Pendopo Agung – a grand hall dating back to Majapahit times – at night. Thanks to The Ministry of Education and ISI (Institut Seni Indonesia = Indonesia’s Institute of Art) Yogyakarta for holding this event. We were very fortunate to come to Trowulan at the very right time. This was my very first time to watch a ballet. Played with an orchestra from ISI, and supported with a well set lighting, this ballet would last in my memory. The play began with the fall of Singhasari and the rise of a new kingdom of Majapahit. I had to choose between enjoying the performance and taking pictures of the stage. So I sat at the edge of the stage corner, and had to make sure that I didn’t block anyone’s view to the stage. I knew that was not the best position to capture the performance, so I only took few pictures and most the time, I watched the ballet. I got to say, the students of ISI performed amazingly well. Under the reign of King Hayam Wuruk and Governor Gajah Mada, Majapahit became a great empire and grew to its greatest size, encompassing more than half of modern South East Asia. In this ballet, everyone coming from different countries and ethnic groups in that glorious time was described to welcome and celebrate the life under Majapahit’s rule. And that was the end of the ballet. My amazement at Trowulan suddenly grew bigger with the coming of mist that night. This was something beyond my expectation since we were not in a mountainous place. This phenomenon of nature was actually recorded in history when the troops of Majapahit, under the command of Raden Wijaya (the founder of Majapahit) successfully defeated the Mongols invaders with the help of the thick mist coming in the evening. We were supposed to stay at a Buddhist monastery that night since it provided many rooms for tourists and visitors. But since the rooms were fully occupied by students of ISI, we had to stay at other places. Thanks to our ojek drivers who show us some place where we could stay overnight. It was a house belonged to an Arab descendent family, and we rented one bedroom for three of us: me, Arief, and Denok. That night I slept with satisfaction of the trip we had had that day. On the following day, we planned to head to Mount Penanggungan, kilometers away from Trowulan, to see some old temples and historical sites dating back to Singhasari and Majapahit periods. I’m going to write that trip on the next post.
" But I was surprised with the presence of a small statue, put at the front right, that to me, appeared to depict a European guy wearing a round hat and a curly collar on his shirt, and he was bearded. Was it possible that some European guy long before the first Portuguese explorer landed in Java, came to Majapahit? Well, I didn’t know for sure, but this was something new for me"
you're right, that was Portuguese and Spanish merchant whose has some investment in Majapahit before the fallen of the kingdom, when Raden Patah whose used by Wahabi's Sunan Giri to attack his father Brawijaya without counter attack the Portuguese fled to Malaka. At that time, Brawijaya want to fled to Bali, and his entire army waiting there re-route the to reinforce. but Sunan Kalijaga (which is not involved in the rebellion) and his advisor Narayana and Nayagenggong advised not to reppeled the rebellion to avoid more blood bath among the citizens (not army, because at that time, many of people they fight each other in the name of religion)and said that is the fate that has to be fulfill. And then Brawijaya gave up his crown to Raden Patah. That is why Demak have power to siege the Portuguese's stronghold at Malaka twice for years because he gain the power of the whole Majapahit Army and Navy. Thank you for this valuable information. 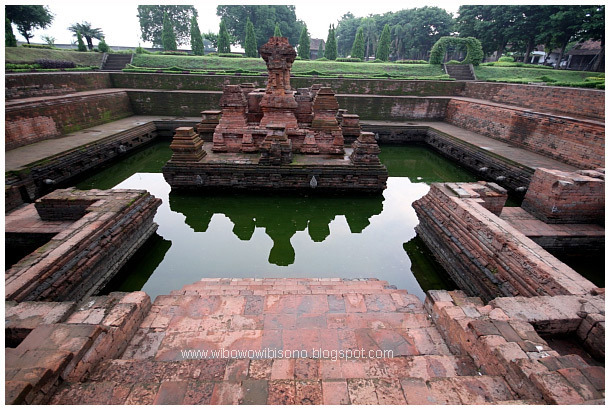 I had never been really interested in the history of Majapahit until I visited Trowulan. You were right, the part when Majapahit (the great Hindus empire) collapsed and replaced by Islamic kingdoms was interesting. I still wonder how exactly it happened. Was there some sort of a big conspiracy (considering the trade with Muslim traders)? or else? Yes, how come we lost all those civilization? There was something like a missing link between our civilized ancestors with us today. Many of us blamed it on the natural disaster. 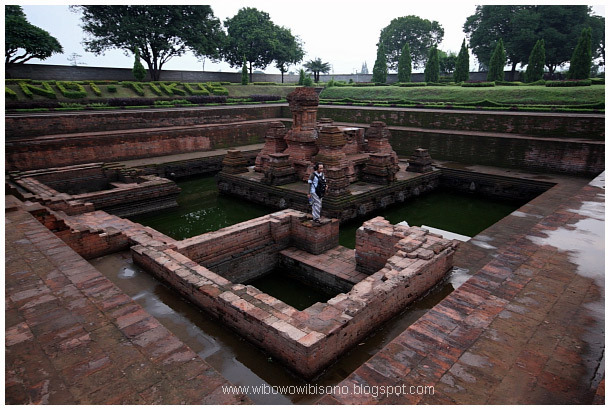 As for Trowulan, it was said that a big flood (mud, not water) had swept out the city. Well, I don't know. I should trace it further. The missing link because of there was a political issue which is kept for hundreds of years by European, Chinese and the ex- nusantara's kingdoms include the Islamic Javanese kingdom itself. During Sukarno and Suharto reign, they know that "the Wahabi's" is an "api dalam sekam", that is why they crushed them and made the follower life not easy (but now seems like they rise again, you know which one i'm talking about. i believe someday if our authority did not take care about them, our history will be repeated again). European actually just take advantages from the chaotic situation which they know that no body can unite the ex-empire again. Palembang, Banjar, Bone, Gowa, Mollucas, Malaka, they were freed and became Sultanate which the first sultan was actually ex Majapahit's Governor and Army General, Java separated into 3 kingdom, Banten, Demak - later on became Pajang then Mataram - which they are truly Majapahit's successor & Cirebon. and Bali became the hindu's stronghold for the people whose do not want to convert. Well, as far as I tried hard to conceive what you were saying in English, I got your points. I should browse around about Wahabi and its teachings. Ah, cerita yang menarik. Jadi malu belum pernah kesitu, padahal cuma 1,5 jam dari rumah. Satu setengah jam dari rumah?? Tinggal di Jombang kah? Aku Lamongan asli mas Wib! hehe.